Looking through my eyeshadow collection, I definitely tend to use palettes more often than singles, duos, or quads. Palettes have so much variability and you can use one palette to create many different eye looks, therefore I reach for them on the daily. Some are better than others, of course, so here are the ones that I use the most often! I’ve had this little gem in my collection for several months now, but just recently started using it again. A lot of the shades are perfect for spring! I prefer shimmery/metallic shadows to matte ones, so this palette is perfect for me. It includes four mattes and six shimmers, all in very wearable but unique colors. My favorites are kitten, bubbly, luster, and bare, but I can honestly say that I use all of the shades. This palette is really high-quality and it’s a great value for money as it also includes a smudge stick! Full review here. I definitely talk about this too often, but I adore this palette so expect to see it a few more times if you read my blog regularly! It’s a great shimmery neutral palette inspired by the ocean. The packaging, while hard to photograph, is to die for and the shadows have a great buttery formula. The shimmers in this palette are much better than the ones in the Tartelette in Bloom palette, which we’ll get to later. My favorites are mermaid, abyss, reef, starfish, and cove but again, I use all of them. Full review here. Generally speaking, I’m a fan of neutral palettes. However, I feel like everyone who is makeup obsessed needs at least one color palette, so this is mine! There are some unique shadows in here and they’re all really pigmented. Every single shade is shimmery so sometimes I’ll use a matte palette and then pop one of these shimmery shadows into the crease or the lid. 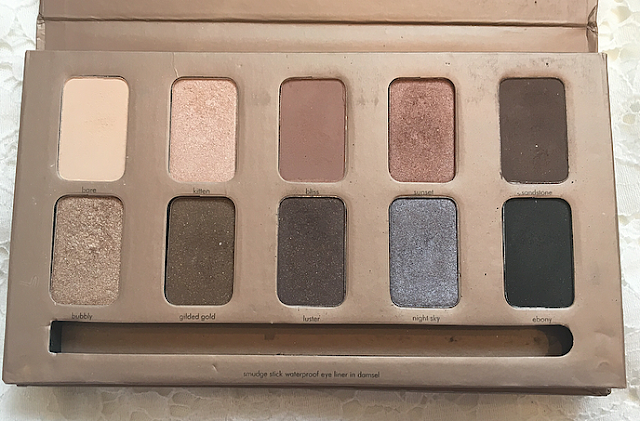 The quality of these shadows are nowhere near as good as the other palettes in this list, but this is one of my most-used palettes so I’m including it anyway. Let me know if you’d like a full review on this! And back at it with the neutrals! 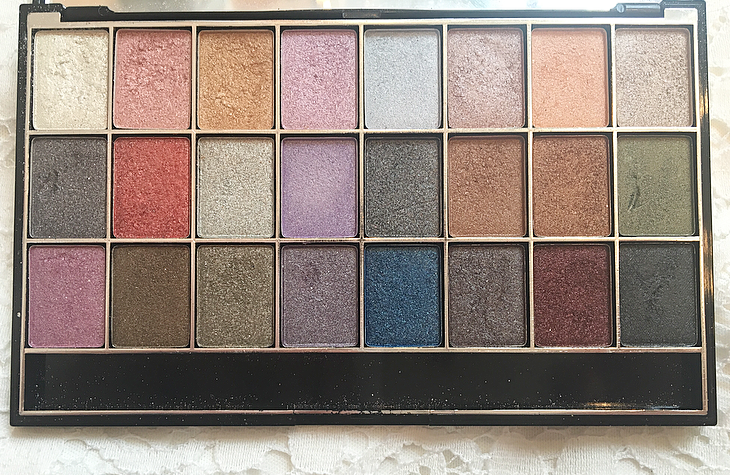 Everything about this palette—the packaging, the shades, the quality, the scent—screamed my name. If I’m feeling a matte look, this is the palette I usually go to. My favorite shades are milk chocolate, black forest truffle, marzipan, hazelnut, haute chocolate, and cherry cordial. The colors in this palette are muted and very wearable. I will be doing a review on this soon so keep your eye out for that! 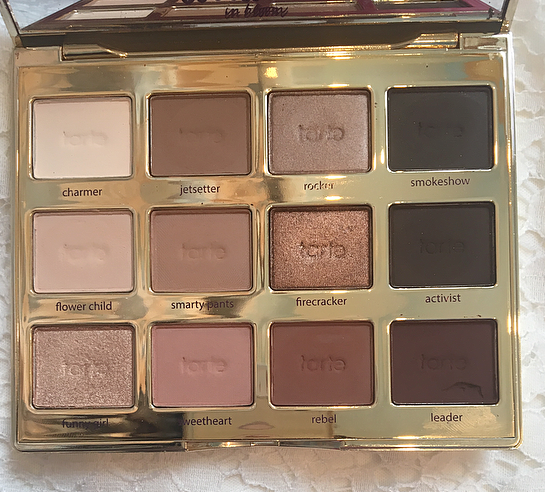 Another neutral, Tarte palette, this one is neutral with mostly matte shades. The mattes are incredibly soft, pigmented, and blendable. There are also a ton of ways to combine these shadows! At the moment I mostly use the left half of the palette, which has lighter shades, but the right side will be perfect for autumn and winter. Full review here! 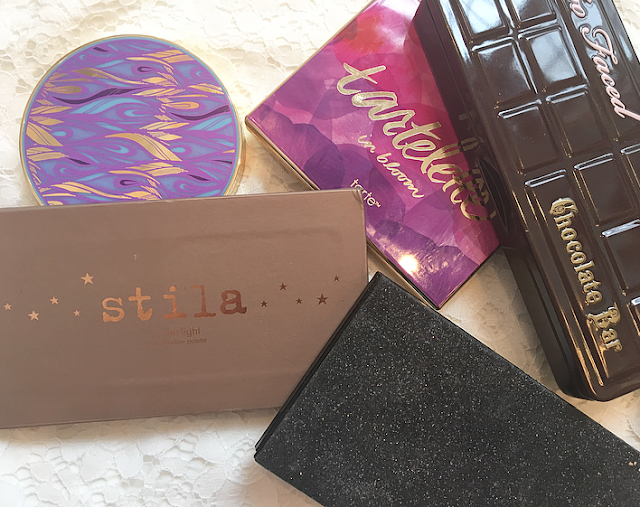 And there you have it—my top five eyeshadow palettes! Do any of these make your list? What’s your favorite palette? 39 comments on "Top Five Eyeshadow Palettes"
Wow all of these palettes look so pretty! 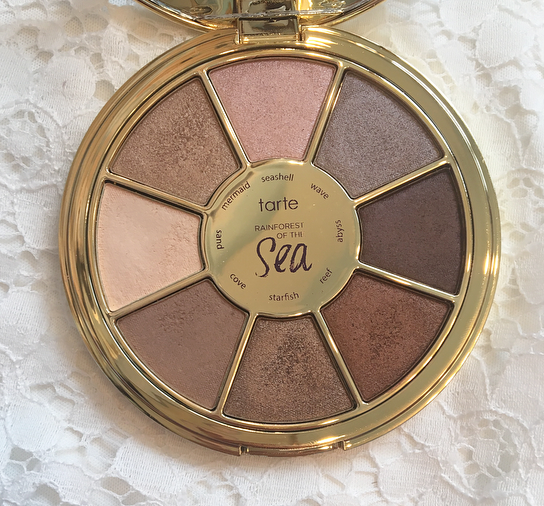 I especially like the look of the tarte tartelette in bloom palette! My all time favourite eyeshadow palette is the Urban decay naked palette! Great post! I need the Tarte and Too Faced palettes in my life! I have the In the Light Platte but there is just something about it I don't like and I have no idea what it is because it's so pretty in pictures! I haven't bought a palette in ages but the Tarte one is looks super appealing right now! I'm such a sucker for neutrals hahah. Thanks for sharing! Tarte Tartelette looks so gorgeous! I only have one - the Naked Basics 2, which I barely use because I'm very minimal with makeup, but every time I see a post like this, I just want to get them all! I really have never been into eyeshadows, but seeing these beautiful palettes makes me want to! I really want to get the Rainforest of the sea palette! I have been eyeing it for a while, but I think it's time. I haven't heard of Tarte before, but both of their palettes are my favourites out of this bunch! Will defo have a look in to the brand. I have the Too Faced Chocolate Bar, and I keep going back and forth on whether I want to get the Tartelette in Bloom! It looks gorgeous, but I have so many neutrals already! I need more matte eyeshadows in my life so I am eyeing up the Too Faced Chocolate Bar palette so hard right now! The Tarte Rainforest of the Sea palette is also rather tempting. This post is going to be bad for my bank account! Aaaaah I want those tarte palettes so badly! I need to do a Sephora order soon, Now that they ship to the UK its just so much more fun doing an order! The Hard Candy Holiday palette looks great, I love the pink shades. I don't own any of these, my eyeshadow palette collection isn't that big. Great post. The pinky shades are some of my favorites! Awesome palette picks! 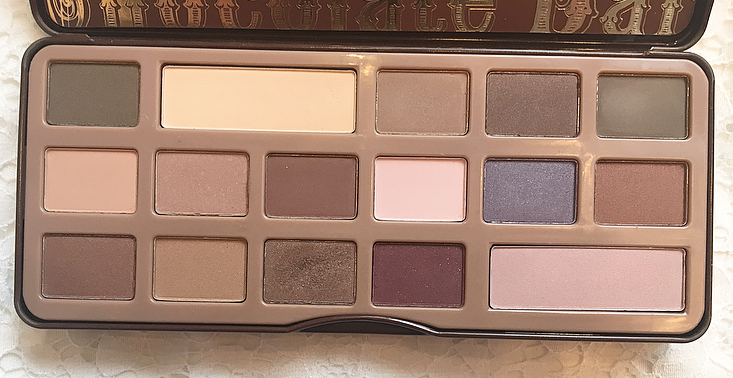 I have the Too Faced Chocolate Bar palette and I love it although I haven't been using a whole lot of e/s lately. The Tartelette in bloom palette looks so pretty! The Chocolate Bar palette is definitely my favourite, I need to try some of the Tarte palettes they look so gorgeous! Double Tarte in one post! I definitely love the Tarte palettes in particular rainforest of the sea however I am reluctant to buy any more Tarte products after my experience with the Amazonian Clay Foundation - Review coming soon! I also love your Hard Candy palette! I really really want to try Tarte, their eyeshadows especially! My sister is going to New York soon, pretty sure I'm going to ask her to pick this palette up. Both of those tarte palettes look stunning! I'm running a giveaway for your chance to win a pair of sunglasses of your choice! I love palettes so much, I literally need all of them in my life! Great post. All of these palettes look amazing! I really want to try out Tarte! I have the original Tartelette palette and it's one of my favorites. I really want that Chocolate Bar palette too.